PHILADELPHIA 56 • SHOPPING CENTER BUSINESS • September 2018 T he Center City district of Phil- adelphia continues to show impressive retail growth af- ter two decades of development and investment. In addition to convention, tourism and entertainment growth, the area's residen- tial population has increased by nearly 20 percent since 2000 and occupied hotel room nights have increased by 22 percent since 2010, according tow a report by Center City District. Today, around half a million workers, residents and visitors generate more than $1 billion in annual retail demand within the downtown core and surrounding areas. In response to the growth, more than 66 national retailers have located in Center City since 2013. 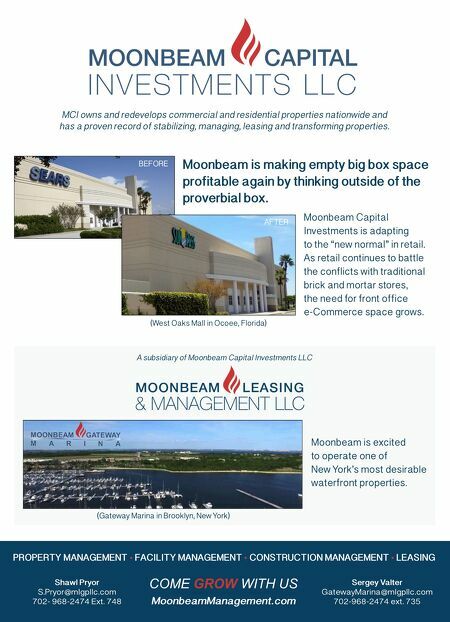 The district is now home to around 1,000 retail tenants, mostly in apparel, as well as 990 food and beverage establishments, including 453 full-service restaurants and 319 quick service restau- rants. The district is also home to more than 1,200 service providers. 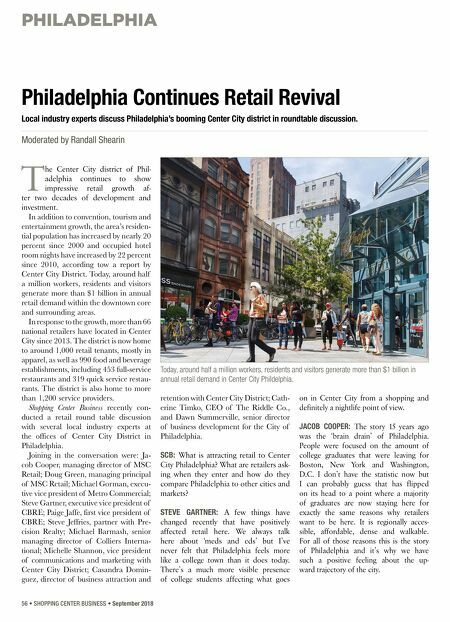 Shopping Center Business recently con- ducted a retail round table discussion with several local industry experts at the offices of Center City District in Philadelphia. Joining in the conversation were: Ja- cob Cooper, managing director of MSC Retail; Doug Green, managing principal of MSC Retail; Michael Gorman, execu- tive vice president of Metro Commercial; Steve Gartner, executive vice president of CBRE; Paige Jaffe, first vice president of CBRE; Steve Jeffries, partner with Pre- cision Realty; Michael Barmash, senior managing director of Colliers Interna- tional; Michelle Shannon, vice president of communications and marketing with Center City District; Casandra Domin- guez, director of business attraction and retention with Center City District; Cath- erine Timko, CEO of The Riddle Co., and Dawn Summerville, senior director of business development for the City of Philadelphia. SCB: What is attracting retail to Center City Philadelphia? What are retailers ask- ing when they enter and how do they compare Philadelphia to other cities and markets? STEVE GARTNER: A few things have changed recently that have positively affected retail here. We always talk here about 'meds and eds' but I've never felt that Philadelphia feels more like a college town than it does today. There's a much more visible presence of college students affecting what goes on in Center City from a shopping and definitely a nightlife point of view. JACOB COOPER: The story 15 years ago was the 'brain drain' of Philadelphia. People were focused on the amount of college graduates that were leaving for Boston, New York and Washington, D.C. I don't have the statistic now but I can probably guess that has flipped on its head to a point where a majority of graduates are now staying here for exactly the same reasons why retailers want to be here. It is regionally acces- sible, affordable, dense and walkable. For all of those reasons this is the story of Philadelphia and it's why we have such a positive feeling about the up- ward trajectory of the city. Philadelphia Continues Retail Revival Local industry experts discuss Philadelphia's booming Center City district in roundtable discussion. Moderated by Randall Shearin Today, around half a million workers, residents and visitors generate more than $1 billion in annual retail demand in Center City Phildelphia.